Private house construction is definitely in recession. The housing start numbers for May were horrible. Here are the sorry details. Total housing starts were at their second lowest level since 1996. During the height of the bubble, the construction industry started an average of 1.96 million homes a month. During the first five months of this year, the industry started only 1.47 million homes. That represents a fall of 33 percent relative to the top of the bubble. 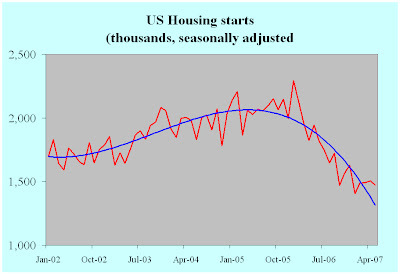 The blue line in the chart represents the trend in recent housing starts. It suggests that the housing slowdown has a lot of momentum, with little sign of recovery on the horizon.